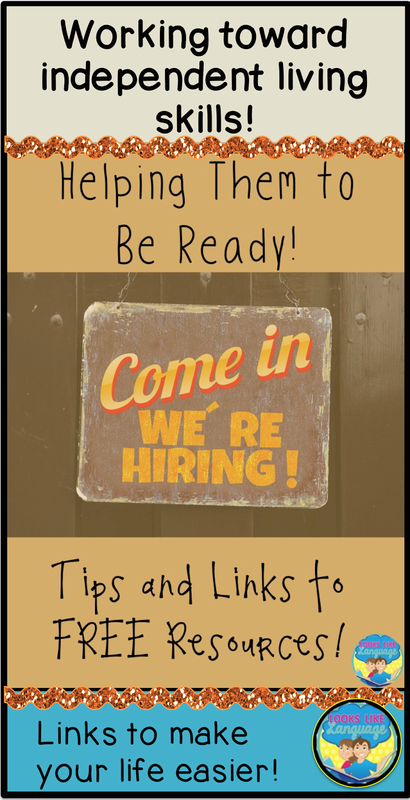 If you read my post on my sister blog, Speech Spotlight, you already know that I am thinking about how our job really doesn’t end, even if our schools are closed for the summer. On a similar note, the education of our moderately to severely impacted students doesn’t really end when they turn 21. However, it is much more difficult for families to get the help that they need at that point in time than it is when they are school aged. Because of that, it is so important for us to think about our students’ functional communication skills so they can achieve the greatest amount of independence possible as adults. 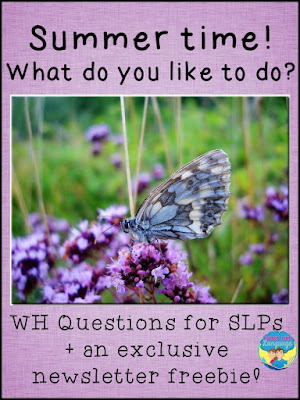 Parents and special educators, don’t tune out because the next sentence starts with SLP! You will want to see the resource links in this post! As SLPS, we need to support our students and their special educators who are teaching them the life skills curriculum needed for independence. 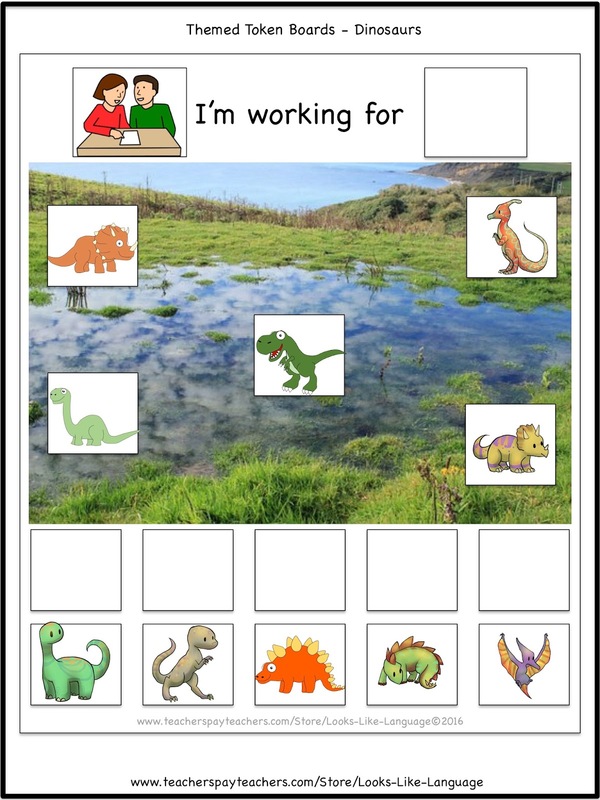 Learning the tasks to do has to be supported by being able to communicate appropriately, especially when something in the learned process breaks down. Here are a few points I found important to think about when figuring out what communication skills are needed. When a problem behavior begins, look at the communication function that it may serve. What happened to provoke the behavior? Was there something that the student may have needed to communicate, but lacked the ability to do so? The frustration in this situation can lead to inappropriate behaviors. Teaching the appropriate communication skill can help reduce the unwanted behavior. It has been my observation that students who have more appropriate social communication skills are given more opportunities. Period. When all goes as expected, the student’s day may be smooth. 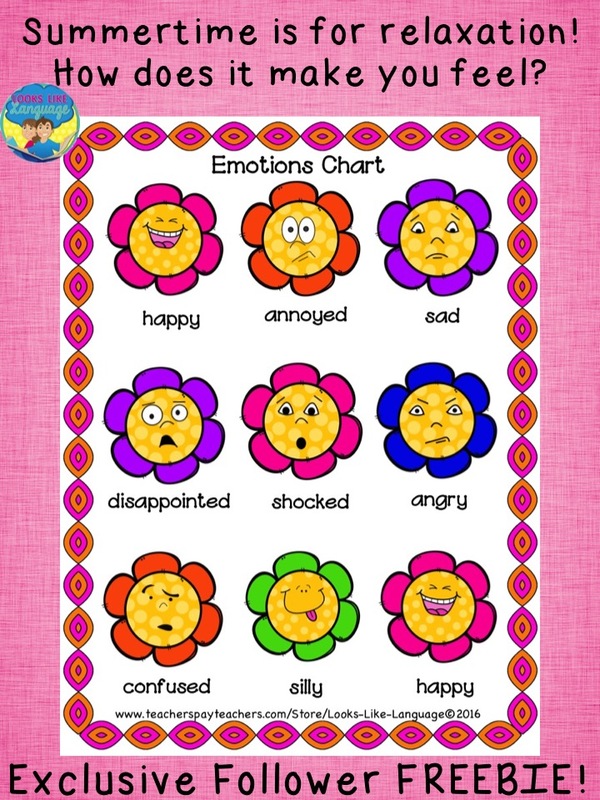 When something unexpected occurs, not only is it more anxiety producing, which is difficult enough, but the student may lack the communication skills to get the help that is needed. We need to think ahead, to try to figure out what could go wrong, and make sure that our students have the ability to request help. Sabotaging the situation is a great way to give students the practice needed in using these communication skills! For me, the best place to start is by gathering information about what is expected of our students. Communication skills are very individualized, so there are limited resources for this on the web. However, I was able to find some free resources for assessing the skills that are needed for independence. I just love it when someone else has thoughtfully done some of the work for me! This autonomy checklist is great for special educators and parents to assess the teen’s needs, as well as to note progress. It lists many of the functional skills needed for independent living in a handy format. SLPs, I used this to help me think about what a student might need to communicate while doing these tasks (especially when something goes wrong) and to assess whether my students had the necessary language. This outline of the PALS Life Skills core curriculum lists varied skills needed for less impaired students to function independently. I know there are some that I wouldn’t have thought about! This is a very cool online assessment tool that gives links to assessment materials based on students’ grade and disability. This is a great checklist for independence skills for teens, geared especially toward parents. This free download assesses the skills needed for functioning in the community, including some communication skills. This is probably my favorite of all of these links! They did an amazing job compiling checklists at three levels for joint attention, greetings, self regulation, conversations, perspective taking, social problem solving/critical thinking skills, friendship and life skills. They also included a recommended resource list. If you only check out one of these links, get this one! I try to work together with my students’ special educators, so we are addressing the communication skills for the life/job skill they are working on currently. Although our time is limited, observing how my students communicate during life skills training helps me to determine what needs they have. Then, I can work on teaching the communication skills in a variety of activities and touch base with classroom staff to see if the skills are generalizing. For very limited students, who don’t generalize well, I try to replicate the situation as well as I can, as I am not usually able to be on site. Then I incorporate the help of the classroom aides to fine tune and carryover the skills while they are on the job site with the student. Working together, we can help our students/children gain more functional communication and independence! Summer is a great time to recharge! When my kids were younger, I loved having that extra time with them, feeling like a stay-at-home mommy. Now my kids are grown up, but you know what? I still love having that time! 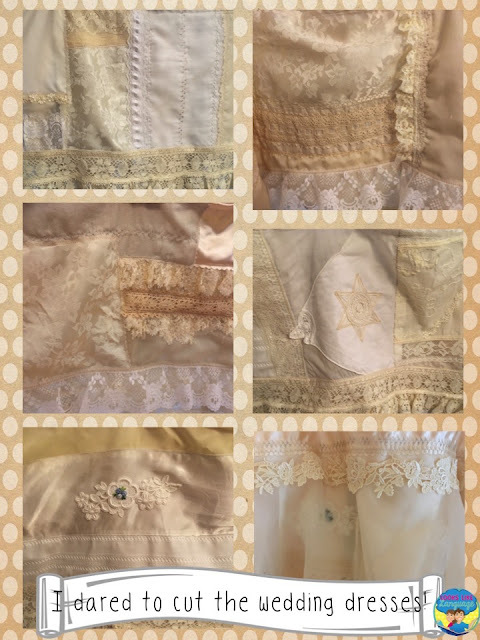 I gathered wedding dresses from family members that were just sitting in attics and boxes and I CUT THEM UP! I’m turning them into a chuppah- a traditional Jewish wedding canopy. What could be better than getting married under the wedding dresses of your loved ones? Isn’t that so much better than having them sit and molder away in an attic? This is still a work in progress, since I am designing as I go, but I thought I’d share a few photos of it in progress. You know I will be busy this summer getting this done! 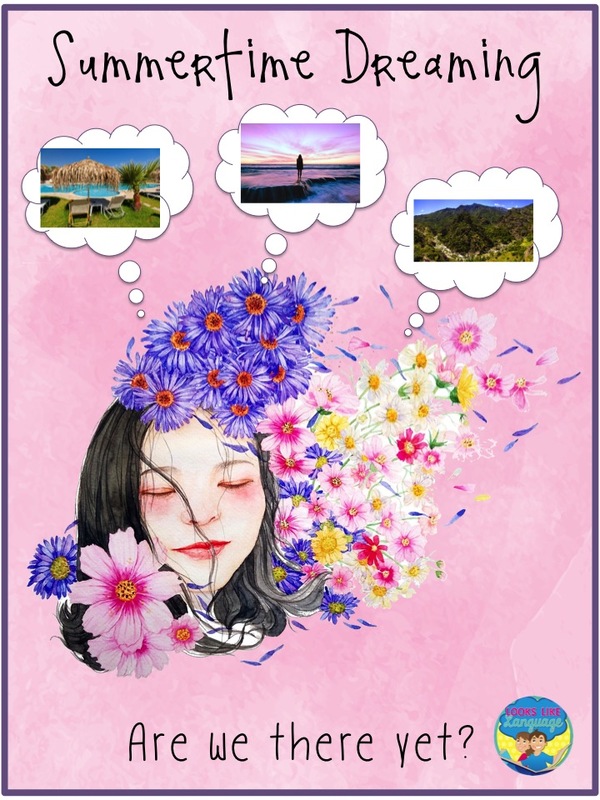 What do you like to do in the summer? Any other quilting teachers or SLPs out there- I’d love to find out your summer project! 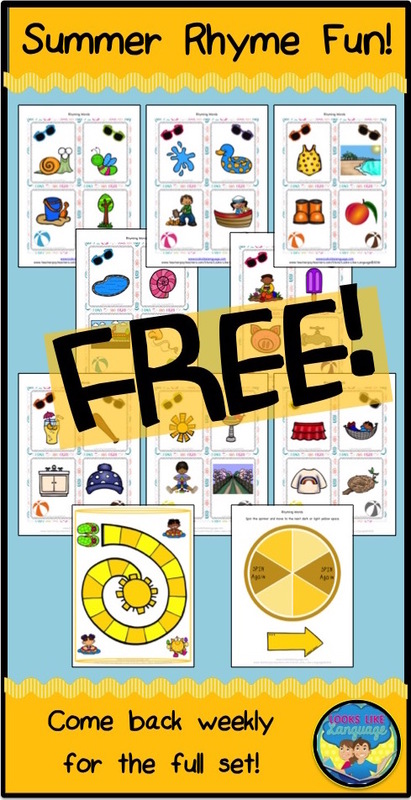 You have all of the cards, so today you are getting the game board for this fun summer freebie! The cards can be used by themselves, but game boards are always fun! When it is easy to match the rhyming words, it is time to step it up a notch! 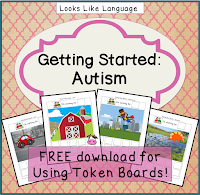 +Use the cards with the game board and see if they can provide a rhyme of their own for the picture card they have chosen. +When rhyming is easy, try one of the other game variations in the packet. For example, have your child say the sound that starts the word and then say another word that starts with the same sound. 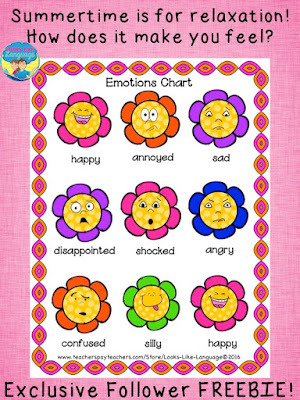 For children to learn to read, they have to be aware of the sounds in words and be able to play around with them. You are getting them off to a great start if you are helping them do this in a way that is fun! Be sure to download the open ended board game! While summer is definitely a time to relax and recharge, most school SLPs often spend a good amount of time working, as well, even though they aren’t physically at the work location. They may or may not be getting paychecks, depending on if they had some of their salary held back, but there is still a lot to do! Whether you are organized or just wannabe, this summer series can help you out! There’s no time during the school year to actually re-organize the materials that were used during the school year so you can easily find them when the school year revs back up in the fall! Some of us bring materials home, while others go back to school. Home has the benefits of air conditioning and a good movie while you are cleaning, but the drawback is that you have to carry everything back and forth. I go with working at home. Which do you do? Place 1 original of the worksheets that you find useful, with a yellow highlighter mark in the corner, in a page protector for storage with similar themed materials. Keep them in binders based on skill or theme. If you’d like to read more, check out this post. Invariably, we get some student(s) who have a disorder we aren’t as familiar with, a severity level that needs a lot of practice, or who just needs more strategies than usual. This sends us back to the drawing board to learn more, maybe getting those CEU’s in a useful way, and become a bit more prepared to address those needs again in the fall. It can be very difficult to find classes to take that are in your area, cover what you need to learn and fit your schedule, all at the same time. 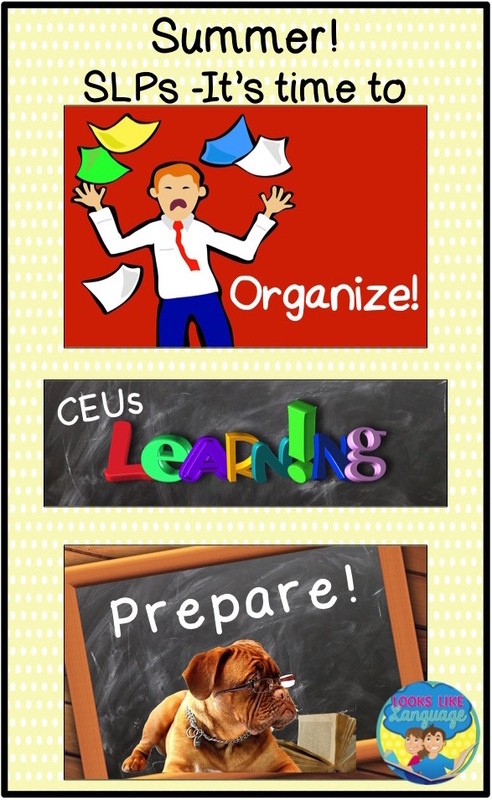 I signed up for online CEUs this year and I am really glad that I did! If you work with a moderately to severely handicapped population, it seems like you can never have enough materials for your students to learn the skills. Either you have to practice the same skill over and over with different themes and presentations so that they gain some mastery, or you have such varied learning styles that one size does not fit all. You’ve had this experience, I’m sure! 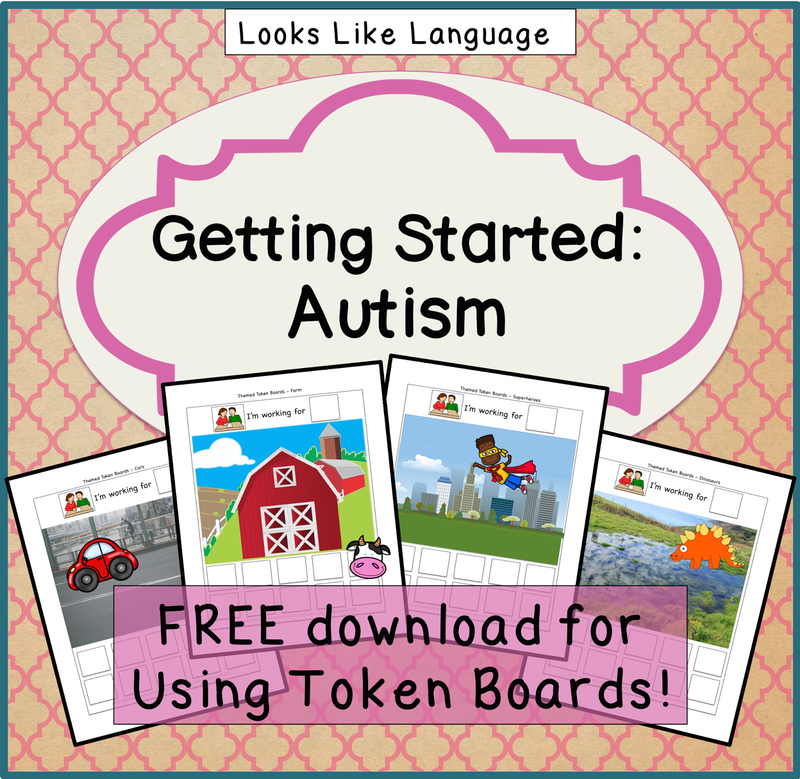 There are so many wonderful free downloads available to fill out your theme based or skill based sets of materials! Make some notes as you are cleaning and re-organizing to help you in your search! This summer, I’d like to help you with all of this, whether you are an organized SLP or a Wannabe! 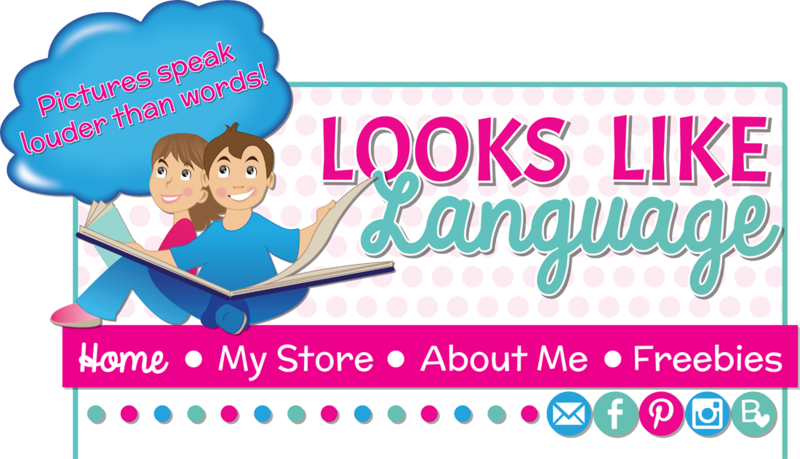 Every week I will post some online links for learning resources and free materials to download based on speech/language skills or themes. While links change all the time, if you check in weekly they should still be working! Let me know if there are any areas that you would particularly like to see covered. Enjoy! Rhyming is an important skill for reading, so I am delighted to be helping some children out there with this! + Play a hot potato rhyming game! Use any soft toy, such as a stuffed animal, or even take one of those unmatched socks we all have lying around. Roll it up in a ball to be the hot potato. + The first person says a short word and tosses the potato to the next person. Don’t be caught holding a hot potato for too long! Say a rhyming word quickly and pass the potato on to the next person. The person who can’t think of another rhyming word, just holding the hot potato, loses the game. + You can play this with 2 or more people. If you have a group, the person who lost can sit out, with the game continuing until one person is left. If you are playing with just you and your child, see how many rhymes your child can do in a row. Watch it improve with practice! Be sure to get this week’s game cards here. See you next week! Hi again! 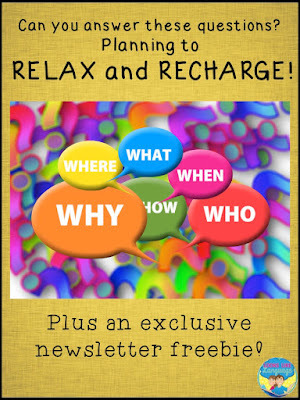 It’s time to get your Freebie for a Fun Friday! This packet can be used as a card game for basic games like matching and go fish. If your little players get good at matching rhymes, add a twist by having them name an additional rhyming word to keep their match. Since rhyming and playing with the sounds in words are so very important for helping children learn to read, play rhyming games anywhere you have a few moments. Once your children learn the skill with pictures, have them play the game in the car. Challenge them to see how many rhyming words they can think of before you get to your destination. Can you believe that you will be helping your children become better readers by playing such a fun game? Download it here. What do we do for our friends and (well-liked) co-workers? Help them out, of course! When helping them is also helpful to us, it just is so nice all around! One of my co-blogging pals reached out to have some guest posts for her blog, and I am thrilled to tell you that I am the guest blogger at TeachSpeech365 this week! I am happy to lend a hand and delighted to make contact with some new SLPS. We address so many different communication goals, at so many ages and levels, that we all can benefit from each others’ experiences. I think we all especially need the help when we are overwhelmed with paperwork at the end of the year and are so ready to be done! 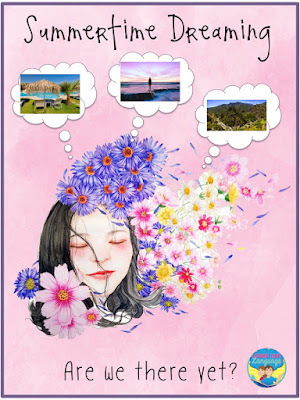 So, if you pop on over to TeachSpeech365 to get this week’s ideas (including links) for managing the end of the school year, maybe you’ll find some other helpful tips while you are visiting there! To my newsletter followers, thank you so much for your support! 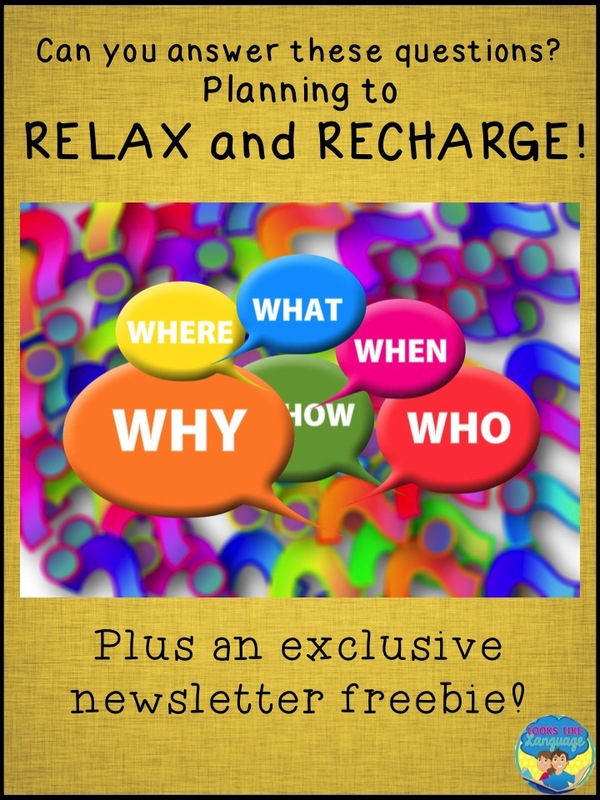 Be sure to read all the way through your newsletter today and get the link to your EXCLUSIVE follower freebie! Check back here later this week for the next part of my freebie for summer! Welcome back! Are you ready for some more rhyming fun? 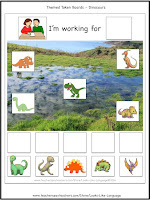 Match the summery pictures with a rhyming word to build your child’s or student’s sound awareness skills! Rhyming is such an important, yet fun, activity to do with young children. Being able to identify and provide rhymes plays an important role in learning to read. 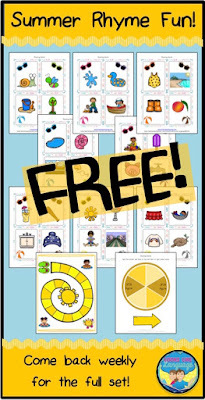 So, download this updated freebie and help some children with their pre-reading skills. You’ll be glad you did!